Skaerbaek power station in Fredericia, Denmark, was converted to produce heat and electricity using wood chips. Image courtesy of Dong Energy. Construction on the biomass-fuelled Skaerbaek CHPP started with the official ground-breaking ceremony on 28 August 2014. Image: courtesy of Babcock & Wilcox Vølund A/S (BWV). Steam drum is being hoisted to place it on top of the station's boilers. Image: courtesy of Dong Energy. 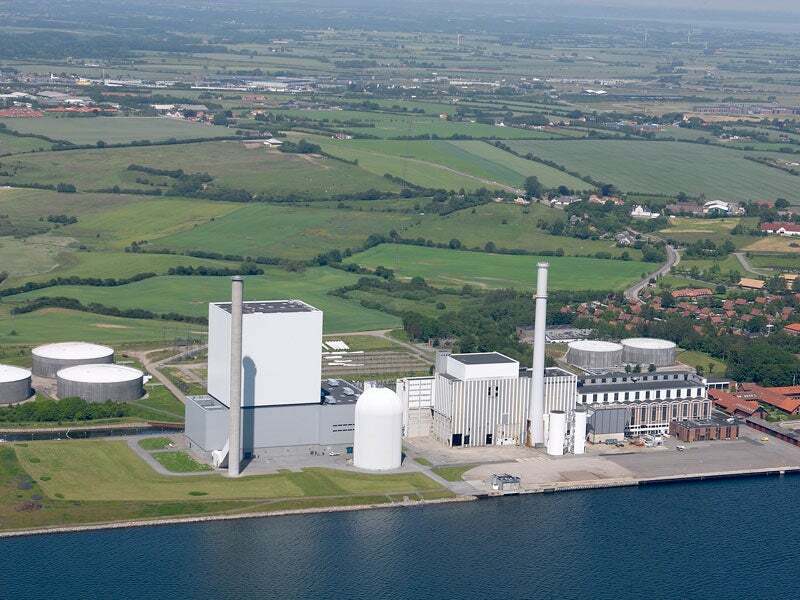 Dong Energy transformed its natural gas-fired Skaerbaek Power Station in Fredericia, Denmark, into a dual-fuel combined heat and power (CHP) plant. The new facility uses wood chips as fuel to generate district heating and electricity. On 28 August 2014, a ground-breaking ceremony for the construction of the 280MW Skaerbaek power station conversion was held. The project was completed at a cost of kr1.8bn (approximately $259m), in October 2017. It created up to 700 jobs during the construction phase. The plant is expected to supply green district heating to roughly 200,000 inhabitants in the Danish Triangle Region. It can also offset 400,000t of CO2 a year from the atmosphere. Generating electricity and heat from three units using natural gas, the historic Skaerbaek power station was established in 1951 on the northern side of Kolding Fjord. Conversion of the plant into a dual-fuel facility paves way for the establishment of a large, green power and heat production facility in the Danish Triangle Region. The wood chip-fired plant is linked to unit three at the power station, enabling the unit to use the chips as primary fuel to produce heat, while natural gas is used as secondary fuel. Major works include installation of two 140MW wood chip boilers, construction of a boiler building, excavation and concrete works for the conveyor system, and installation of a wood chips storage facility. The plan also included the renovation of the power station’s 250m-long quay, expansion of the port facility, and installation of two new flue gas pipes in the existing chimney of unit two. Heavy-duty steel elements were imported from India for the construction of the wood chip boilers. Sustainable wood chips are imported to the port near Skaerbaek power station and are used as fuel. The first shipload of 3,546t of wood chips arrived at the power station on 4 April. Chips are transported to the power station during the winter months by ships and barges, which have a carrying capacity between 6,000m³ and 16,000m³, and are accommodated at the 175m-long quay. The Skaerbaek CHPP has the potential to combust up to 154t/h of wood chips. Each boiler has been designed to operate 24/7, having a running time of at least 8,000 hours a year. Wood chips are unloaded from the ships and barges using a new conveying system and two new unloading cranes at the quay. Conveyor belts are used to transport the wood chips to the open wood chip storage facility, which has a capacity of up to 80,000m³. Chips are initially placed at the top of the storage facility’s chip pile and delivered to the boilers by using the conveyor belts from the two screw conveyors located at the bottom of the facility. Steam and water generated in the boilers are separated by two steam drums, which are used for the production of heat for district heating. The steam is fed into the existing turbine of the CHP plant to generate heat and electricity. TVIS entered a heating agreement with Dong Energy for the Skaerbaek power station in June 2014. Until 2037, TVIS will pay 80% of the construction costs of the wood chip-fuelled plant and will have the right to the heating capacity generated by the CHPP. TVIS currently purchases the heat produced by CHP plants and in-turn supplies to households and companies in Fredericia, Kolding, Vejle and Middelfart. Babcock & Wilcox Vølund was awarded an $80m contract for the supply of two biomass-fired boiler systems and equipment for the CHPP. Its contractual scope included design, manufacture, supply, construction, and commissioning of the plant’s boiler system. Sweco was the engineering consultant in the analysis, site-development and execution phases. Dong Energy engaged Bilfinger Duro Dakovic for the erection of two bag filters and the flue gas duct at the existing Skaerbaekverket gas-fired power plant. BarkerBille designs and manufactures a variety of highly efficient fans and blowers for industrial power applications both onshore and offshore. Burmeister & Wain Scandinavian Contractor (BWSC) is a highly experienced project developer, turnkey engineering procurement construction (EPC) contractor and operation and maintenance (O&M) provider of tailor-made fossil-fuelled and renewable energy power plants. Krøll Cranes has been manufacturing quality tower cranes on the outskirts of Copenhagen in Denmark since 1955. Its products range from 160tm to 10,000tm cranes, but Krøll is today specialised in heavy-duty tower cranes.